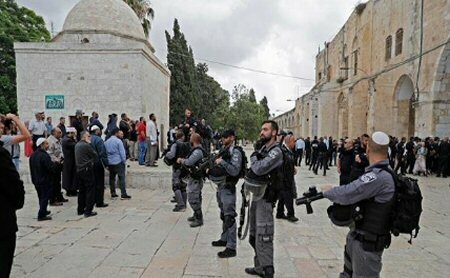 Dozens of Israeli settlers again stormed Al-Aqsa Mosque compound, guarded by Israeli security forces, on Sunday. Local sources reported, according to Al Ray, that Israeli settlers and students of Talmudic rituals broke into the holy site in groups, under heavy protection by Israeli police. Earlier on Saturday, an Israeli police officer was filmed entering Bab al-Rahma section of the mosque while refusing to take off his boots, a step which was seen as desecrating of sanctity of the mosque by the Islamic Awqaf dertment, the organization in charge of the holy sites in Jerusalem. The Muslim holy site recently witnessed the reopening of the Bab al-Rahma worship area, inside the mosque, by thousands of worshipers accompanied by Awqaf officials, after a 16-year closure by Israeli authorities.